Honey Island Swamp, a vast swamp land area in southern Louisiana is considered by many naturalists to be one of the most pristine swampland habitats in the United States. Honey Island Swamp is 27 miles in length and seven miles wide, the northern portion consists of vast pine forests which are under the control of the Bogue Chitto National Wildlife Refuge. The middle and bottom portions of the swamp act as a flood plain for the Pearl river, and are managed by the Louisiana Department of Wildlife and Fisheries. 70,000 acres of this swamp land is permanently protected, very few roads travel into area and is accessible only by boat or foot. The area is a haven for wildlife such as black bear, alligators, white tail deer, feral hogs, rabbits, squirrels, fish, birds and an ever dwindling population of Florida Panther once common across Louisiana. But some believe that lurking the deepest parts of the swamp, parts seldom traveled by man, there lives a monster. Starting in the early 1960�s, as man began to push further into the swamp land, locals began to encounter a large, hair covered, bipedal creature which would come to be known as the Honey Island Swamp Monster. The first document sighting of the creature took place in early august of 1963, when a retired air traffic controller Harlan E. Ford and a friend, Ray Mills, emerged from the deep recesses of Honey Island with an incredible story. The pair of veteran hunters claimed that while out in the swamps they came across a large creature hunched over the body of a dead boar, the strange creature apparently had ripped the boar�s throat out. Mr. Ford described the creature as being covered in dingy grey hair, with longer hair hanging from its head. As the creature glared menacingly at him and his partner, Mr. Ford noticed the creatures clawed hands before it fled into the woods. The two estimated the creature to weight about 400 pounds and stand about 7 feet tall. But what they remembered most were its sickly yellow eyes, set far apart on its skull, and the horrific stench which surrounded the beast. Although Harlan Ford�s and Ray Mills� report was the first official documented sighting of the Honey Island Swamp Monster, stories of this ferocious creature date back hundreds of years. The Native Americans of the area called the creature Letiche, and described it as �a carnivorous, aquatic-humanoid". They believed that it was once an abandoned child who was raised by alligators in the uncharted regions of the swamp. Cajuns called the creature Loup Carou, which has often been misinterpreted as werewolf. The Honey Island Swamp Monster has been blamed for numerous human and livestock deaths which seem to have plagued the area for decades. One of the strangest legends surrounding the Honey Island Swamp Monster revolves around a train wreck which allegedly occurred near the Pearl River in the early part of the 20th century. According to this legend, the train was full of exotic animals from a traveling circus, which fled into the swamps after the train derailed. While most of the creatures would soon parish in the harsh swamp land the legend goes on to tell us that a troop of chimpanzees managed to survive and even went as far as to interbreed with alligators. The result was a strange colony of reptilian like mammals. Some researchers believe that the Honey Island Swamp Monster is related to Bigfoot; the body size certainly is a match as most Bigfoot sightings estimate the creature to be about 7 feet tall and covered in hair. However the tracks found in and around Honey Island Swamp do not resemble tracks collected in the Pacific North West. They are 4 and sometimes 3 toed, much like tracks discovered in southeastern Texas and parts of Florida. Casts made by Harland Ford are about ten to twelve inches long, and have three long thin toes set next to each other and a fourth set back on the inside, rather like a thumb. Some researchers believe that this could be an isolated population of big foot, cut off from other big foot they where forced to breed with members of the same family. When inbreeding takes place, the first area to be effect with genetic deformities are fingers and toes, this theory may explaining why the Honey Island Monster and other southern hominids tracks only have 3 or 4 toes. The mystery of the Honey Island Swamp Monster continues to this day, with a hand full of eye witnesses reporting encounters each year, one thing is for sure, if there where ever an area to hide a large creature from human eyes Honey Island Swamp would be the place. To date there is no physical evidence of the Honey Island Swamp Monster, in 1978 Alan Lamdsburg Company, producers of the popular TV program; IN SEARCH OF did a segment on the Honey island Swamp Monster. 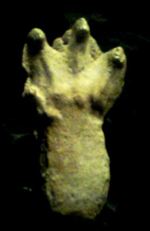 Some plaster casts of the creature�s foot prints have also been gathered as proof, however with out solid physical evidence modern science will never accept the Honey Island Swamp Monster as fact. �	1963, Harlen Ford and Ray Mills report what would be come the first documented accounts of the creature. 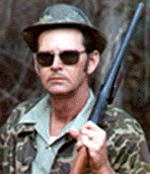 �	1973, a guide was traveling down a bayou in a small boat when it struck something in the water. The guide stopped to see what it was when he saw a creature swim to shore, climb out the water then walk into the woods on two legs. First time I ever saw it, it was standing plum still like a stump. I stopped and realized it wasn't a stump and it wasn't supposed to be there. When I stopped it ran. It was dark gray, about seven foot high, it jumped a bayou [a bayou is the southern equivalent of a stream, except the water moves so slow it may not even appear to have a flow], that was the first time I saw it. The next time I seen him was swimming the river [Pearl River], two of them, one was bigger than the other and faster than the other and they swam just like a human with them long overhead strokes. I tried to get one of them to look at me and the other one ran off and the other one wouldn't look at me. I could've shot it but I wouldn't on account it wouldn't look at me. It looked too much like a human too me, broad shoulders, arms hanging down below its knees, hands looked almost like a humans." "My wife and I were going on a fishing trip about four years ago and at about 9:00pm [the video shows them camping in the swamp] that night I heard this peculiar noise, a scream down the river, I'd say about a half a mile away. My wife wanted me to build a fire so I was out gathering wood, and it screamed again, this time it was closer, maybe three hundred yards. That's when it really scared her, it scared me but I tried not to let her know it scared me, so I went ahead and kept building fires [video shows them building small fires around their camp] and less than ten minutes later it screamed again and this time it was right on top of us. It almost shook the leaves off the trees." "One evening late, just about dark a friend and I we encountered eyes, they were a yellow or amberish color set real wide apart, so this friend of mine, Jim Hartzog, he took a gun and went into this area to try to kill whatever it was and he says he came face to face with this thing. It looked like an ape about seven feet tall, and he fired on it. He said when he did the eyes went away. It most likely turned and ran, he shot at it one more time. So we went back the next day to look for signs and blood but we didn't find any. We figured Jim missed it that night.